Happy Tuesday, peeps, and welcome to Pyragraph Pledge Week! Before explaining why we’re mixing it up this week, let me share a quick story with you: A few months ago I ran into a friend of mine who is the rad proprietress of one of my favorite craft breweries. At one point during our conversation she swept me into the bathroom for a “talk” (I could tell she really had something to say) and she shared with me that she thought I was “giving too much away” with Pyragraph. I wasn’t totally sure what she meant, so I pressed her a bit to clarify and she basically expressed concern as a fellow business owner that Pyragraph (especially me, as Publisher/Editor) was not money-oriented enough. Now, this friend has always been a great supporter of Pyragraph, plus she is smart and savvy and awesome, so I listened attentively. I couldn’t deny much of what she was saying, since we have put significant resources into developing a daily content operation, in addition to helping promote artists, shows, local businesses and more—all as a free publication. We have income, but not enough. What she said was true: We give it away. I told her I’d think about what she said, and I meant it. The truth is, I think about this stuff constantly. All. The. Time. I didn’t want to respond there in the bathroom because I wanted to absorb what she said (plus I didn’t want to let the beers do all the talking, which they might have at that point), but today—as we start our Pledge Drive Week—I’m ready to share a thought or two on the matter. Mainly what I’d say to my friend is this: Imagine a world where there is a free beer tap on every corner. If you want to make a living selling beer, how can you succeed? One inescapable part of the answer, it seems to me, is that you end up giving away a LOT of free beer. Beyond that, you’ll have to get mighty crafty. This is essentially the nut I’ve been trying to crack for the last four-plus years. Our world is drowning in free content; how on earth can anyone make a living producing it? My best answer has been to take a multi-staged approach. First, build a product and a reliable system to produce it. [Check.] Next, develop not just an audience around that product, but a community. [This is ongoing.] Third, find ways to get financial support from that community, and from businesses who want to reach that community. After four years of publishing, we’re just starting to crack this monetizing part. Besides selling products and services to our community, I realized (maybe a bit late in the game) that the simple concept of asking our supporters for money was a valid way to build our operation. That’s what we’re doing this week with our Pledge Drive: asking you and supporters of the arts to financially support our artist-centric publishing project (one that pays its contributors, I might add). We’ll still be “giving a lot away” with continued free content, but we are going to channel my money-savvy friend and prioritize building financial support. The reality is, we need the income. Online advertising only works as a viable source of income for sites with traffic in the millions, and we’re not there yet. We need readers like you—and anyone who values artist-centric content—to step up and help. So, to that end we’re trying something new this week and pre-empting our regularly scheduled daily posting in order to switch focus from other creatives’ stories to OUR story. Pyragraph is humming along and looking better than ever—and we need community support to keep it up. 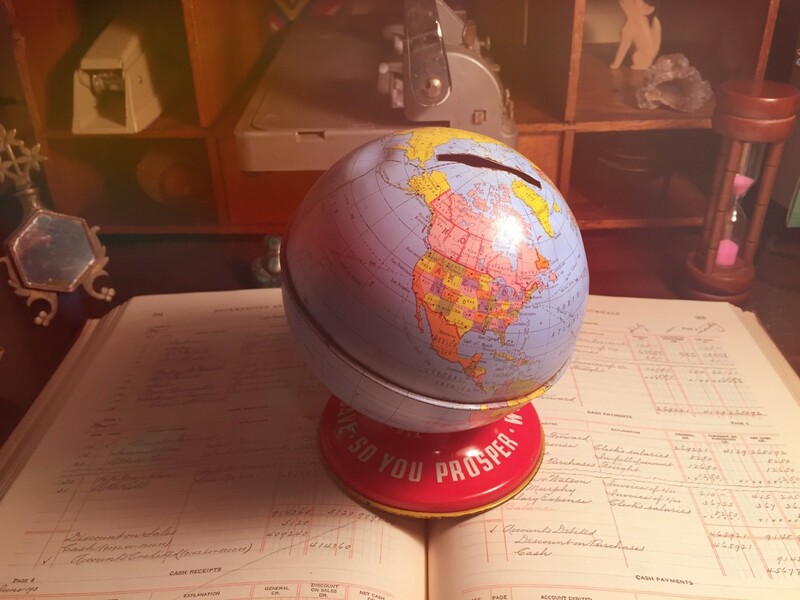 Would you please consider throwing some cash our way via our Support Pyragraph page? When you help us out with a pay-what-you-can subscription, we will be able to sustain our indie publication and pay the awesome bloggers, writers, artists, tech folks and other collaborators who make it possible! Instead of our normal publishing schedule, this week we’re going to shift over to Facebook and Twitter to share posts from our extensive archives—four years’ worth of daily content from working creatives. We want to showcase what we’ve built and establish a foundation for community support to move forward. Can you step up and be part of that community support? If you’ve read Pyragraph for any length of time you know that we value artists’ voices. We know that creatives often work independently and need ways to learn from each other and share support. By offering a platform where artists’ stories can be shared, we hope that our publishing outlet serves as an asset to the creative community. 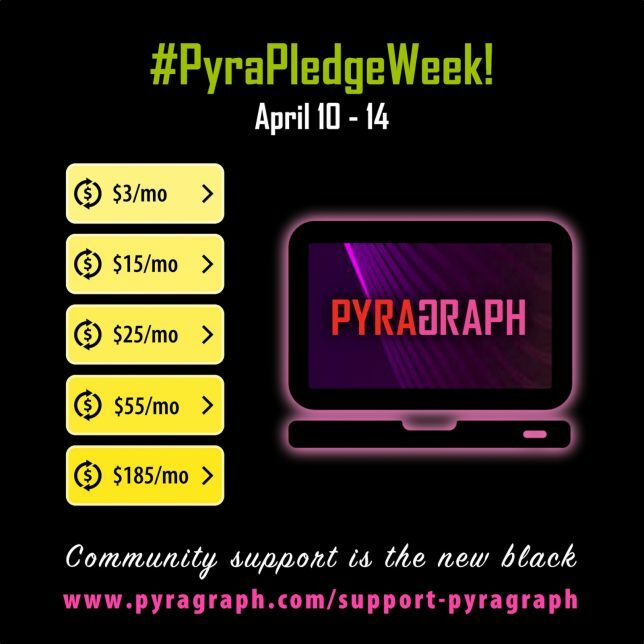 If you value independent media for artists, by artists, we’d so appreciate you supporting Pyragraph. Pay what you can to support our efforts to keep artists’ voices loud and clear. Thanks in advance and may your creative projects keep flowing! PyraPledgeCast Marathon, April 12! We’ll be doing a livestream videocast on Wednesday April 12 from 10am to 2pm! Half-party, half-videocast! Special guests including Eph Sharpe, Steve Westman, Julia Mandeville, JAK Media (Kendra and Austin), Jessamyn Lovell and more! Tune in at www.pyragraph.com/live and shower support at our Support Pyragraph page!